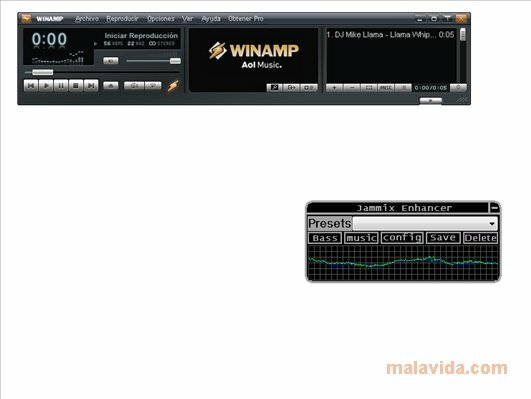 Jammix Enhancer is a plug-in for Winamp that the most demanding music lovers will really like, because it allows us to control several sound parameters, that affect directly the frequencies that are played and, due to this, can greatly improve the playback quality of any song. The plug-in has a somewhat complex interface, that requires some advanced knowledge regarding the use of an equalizer, but it also has a full list of presets, with which it won't be necessary to touch any control. This add-on allows us to modify the frequency and the bass filters, the reverb, expand the stereo image, apply a Phat effect (with which we can provide the music with compression) or use the controls to modify the echo of some frequencies. Furthermore, this development will show us a chart on which we'll be able to see how the audio responds to the changes we apply. It's an ideal plug-in for those people that use an amplifier or auto-amplified speakers to listen to their PC's sound, because it can provide any song with more liveliness. 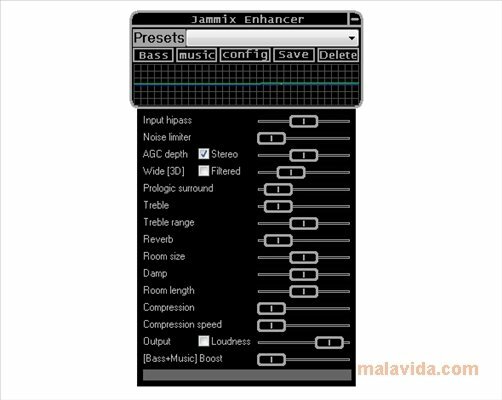 Download Jammix Enhancer and give your favorite tracks much more power.